March 13th, China unveiled a massive draft plan for State institutional reform to meet the public demand. The institutional reform plan of the State Council was submitted to the on-going first session of the 13th National People’s Congress for deliberations. There will be 26 ministries and commissions of the State Council after the reshuffle. Here, we briefly introduce those new entities that relate to our daily life and work the most. 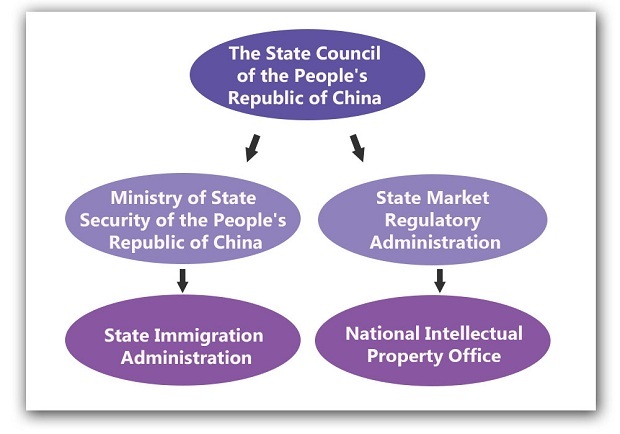 According to the institutional reform plan, China will combine the functions of State Administration for Industry and Commerce(SAIC), General Administration of Quality Supervision(AQSIQ), Inspection and Quarantine and China Food and Drug Administration, forming a national market supervision administration. And a new-structured National Intellectual Property Office will be directly under the administration of State Market Regulatory Administration. 1. State Administration for Industry and Commerce(SAIC) is one of the government institutions related to company affairs the most. they handle company registration, cancellation, annual inspection, or office address alteration. After institutional reform, these works will be under the administration of State Market Regulatory Administration. 2. In late 2017, the current minister of SAIC Mr. Zhang Mao put forward a reform on trademark registration, to strengthen the protection of intellectual property. The procedure for Chinese trademark registration will be further simplified and less time wasted on waiting, it is expected to finish the whole process in 6 months. Tomorrow is International Day for Protecting Consumers’ Rights, Mr. Zhang responded to how to further protect consumers’ rights on the National People’s Congress, “a better-organized credit system for companies is necessary,” he said. Actually, the work of SAIC cannot separate with AQSIQ, they had built up a strong system to check fake products, supported by blockchain, e-commerce companies like Alibaba, JD have joined the program. 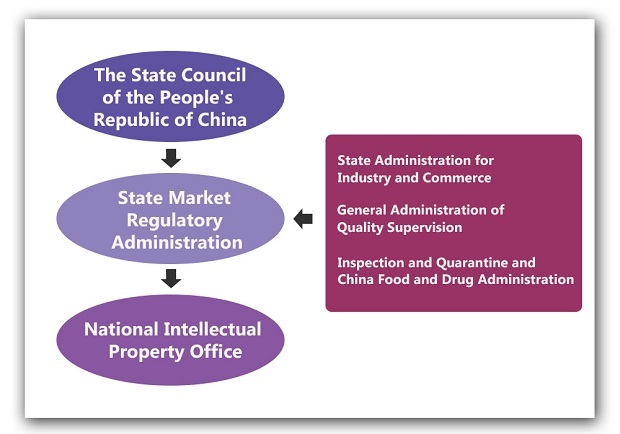 As we know, some factories like imitating well-known brands to confuse consumers, the new institution State Market Regulatory Administration has comprehensive abilities and massive power to regulate the market. According to the draft State institutional reform plan, China will construct a new administration to oversee immigration affairs, under the direct administration of Ministry of State Security of the People’s Republic of China(MSS). Currently, MSS handles the immigration affair, for foreigners living in China, their visa and residence applications are approved by the police officers. MSS serves as an enforcement institution, and this job requires them closely to work with different institutions, like State Administration of Foreign Expert Affairs(SAFEA), which distributes China Work Permit for foreigners. According to the draft State institutional reform plan, SAFEA will be classified into the Science and Technology Department, under the direct administration of the State Council, they are dedicated to attracting more competent foreigners to China. Recently, we found good news on SAFEA’s official website. 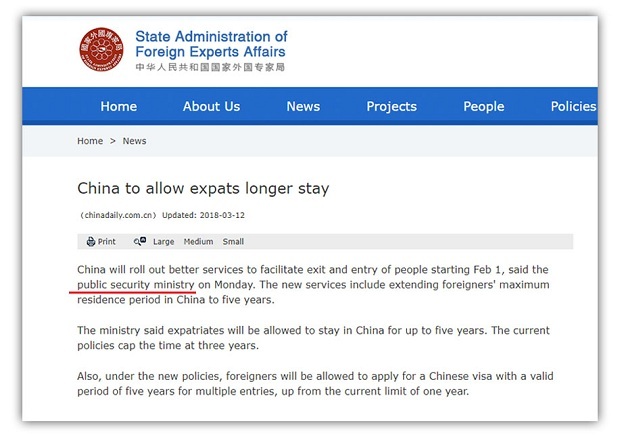 Said by the public security ministry, China will allow expats to longer stay! MSS needs to constantly update the information in their database, in accordance with other institutions. For instance, if a foreigner changes his/her office address. This change should be both reported to SAIC and MSS, otherwise, it causes more troublesome when you reapply for work visa extension due to the incorrect information in MSS’s database. According to the draft plan for State institutional reform, China will combine the system of the State Administration of Taxation and Regional Taxation Administrative Institution on the provincial level and below. Regional taxation administrative institutions manage the individual income tax and corporate income tax, and the Value-Added Tax(VAT) on export and import is levied by State Administration of Taxation(SAT), China Customs collects this part of tax for SAT. As the merger of two taxation system, one of the benefits for companies is their staff don’t need to handle the tax affairs with two institutions. Meanwhile, it raises an alert for most of the exporters, as the tax data become more transparent, it is much easier for different government institutions to regulate the trading environment. The difficulty is, how to get VAT invoice to legally export from China? I think we can answer this question. The cabinet reshuffle plan is very informative when you read it connecting to the recent regulations. The better-structured, more efficient, and the service-oriented government is coming to make us happier, let’s see. My Passport Is at The PSB – Can I Fly? China Is Lowering Hukou Rules , Can Foreigners Get a Hukou? Complete Guide for Canton Fair 2019 (Spring) – Are You Coming? Is the Chinese Taxman After You? © 2016-2019 HiTouch Consulting. All rights reserved.